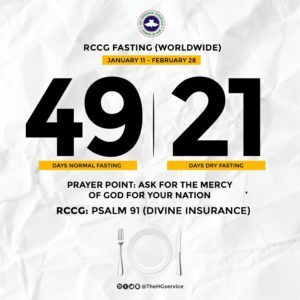 The Redeemed Christian Church of God (RCCG) has commenced its annual fasting exercise for the year 2019. The fast, which starts today is to last for either 49 days of normal fast or 21 days of dry fasting as it suits individuals. Speaking on the fasting and prayers, the General Overseer of the church, Enoch Adeboye, noted that it will focus on prayers for God’s intervention on the affairs of the nation. Also, the prayer points will be a cry for mercy for Nigeria and the church, worldwide. A directorate of prayer made available by the church for members, reveals that the fast is to begin Friday 11th of January to Thursday 28th of February 2019. This entry was posted in Belief, Christianity, Faith, News, Prayer Guide and tagged Enoch Adeboye, Fasting, RCCG. Bookmark the permalink.